Procumbens Nana grows to 12 inches by 4 to 5 feet with curved branches radiating in all directions. Short needles with blue green foliage spreading rapidly. Give it some protection in hot climates. 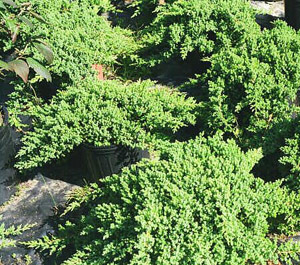 In general, an outstanding, evergreen shrub with dense, upright branches clothed in sharply pointed, bright green needles. Very tough plant.